Check out these tried-and-true methods for banishing marks, gouges, and scuffs to revive the beauty of wood floors. Wood floors bring beauty and value to a home—as long as they are well-maintained. Natural wood is at constant risk of surface wear, water marks, and deeper damage. Prevention, of course, is key: Use area rugs and soft protective pads to move furniture, remove shoes as much as possible, and keep pet nails trimmed. 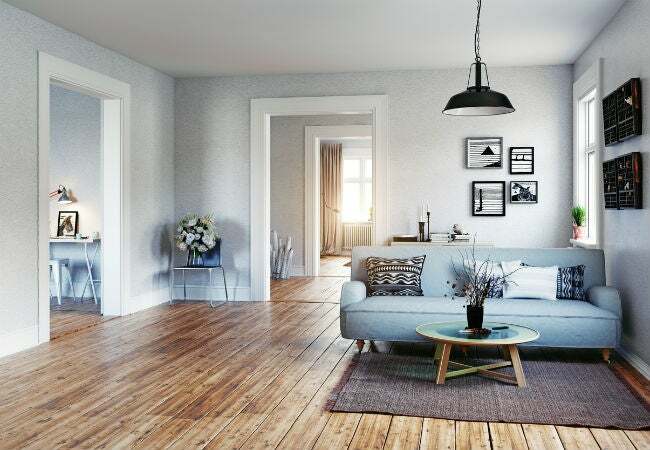 Your floor’s finish works to protect it from everyday wear and tear, but it’s important to know what kind of finish you’ve got in order to maintain it. Consider, for example, a wood floor installed prior to 1970, which was probably finished with varnish or shellac. You can add luster to such a finish with paste or liquid wax, or oil. If your older finish is noticeably scratched, it can be stripped or sanded down, then refinished with a polyurethane-based product—a highly durable finish, resistant to abrasion and easy to clean—just be sure to use only a water-based silicone polish on polyurethane-finished floors. When widespread wear and tear is visible, the time- and labor-intensive process of total floor refinishing may be necessary, and in most cases, that’s a job best left to the pros. 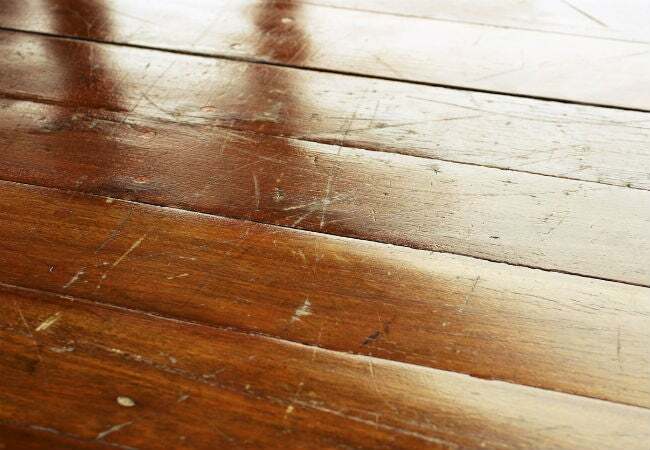 Fortunately, you can minimize or even completely eradicate less serious marks and discoloration with the scratch repair tips below—and restore your wood floors to their former glory. 1. Clean hardwood floors gently. 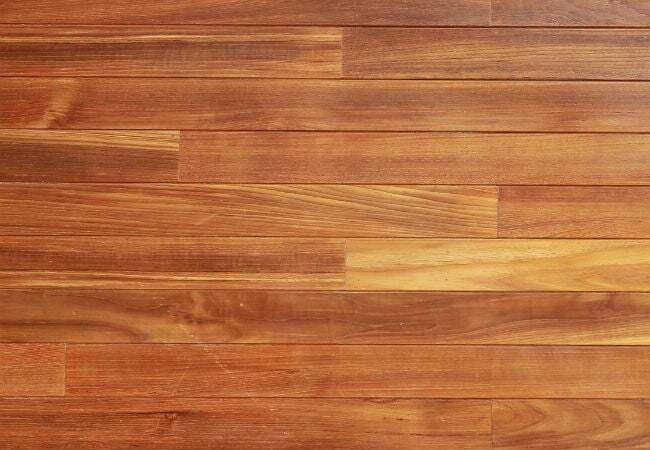 Lackluster wood can magnify the appearance of scratches and worn areas—not to mention that dirt particles ground into hardwood floors can lead to worse scratches—so your first line of action should be thorough but gentle cleaning. Avoid brooms or abrasive scrub pads, and never soak a floor with water or liquid cleaner. Instead, use a soft mop or vacuum (with the appropriate attachment) to remove dust, hair, and surface debris. To clean, add two to four drops of liquid soap to a quart of water, mix in a spray bottle, and mist your polyurethane-finished floor, then distribute the solution with a dry microfiber mop. Next, lightly spray with fresh water and buff with a soft, dry cloth. Commercial non-toxic wood cleaners (water-based, with a biodegradable cleaning agent) safe for polyurethane-finished floors are also available. 2. Sand out the scratches. A little elbow grease can bring life back to wood floors. A fine-grained sandpaper is all you need to buff out damage. First, sand the floor in the direction of the grain. You’ll need to reapply stain that you’ve buffed away in the process, so choose a hidden area (under the bed, in a closet) to patch-test a wood stain that matches your floor color. After you find the right stain, patch test a urethane finish. A water-based urethane dries quickly, with a clear, shiny finish ideal for newer floors—but it may create too much contrast if floors have darkened with age. Oil-based urethanes are strong-smelling, but they dry with a yellow tinge that darkens over time, which may better suit the color of an older floor. Make sure your sanded area is smooth and thoroughly clean before you stain and finish. Walnuts contain excellent natural emollients and brown dyes that both repair and enhance the look of worn, scratched wood. Warm up the oil in the nut with your fingers, then rub into worn areas of the floor using small circular motions. Let the oil sit for a few minutes, then buff with a soft cloth. Coconut oil can also minimize scratch marks on unfinished or freshly sanded floors. Apply a thin coat of coconut oil with a brush or sponge, let it dwell for five minutes, then buff with a soft cloth for richer-looking wood. 4. Make an effective refresher from pantry ingredients. A combo of baking soda and olive oil can help reduce and remove scratches from wood. Vacuum your floor thoroughly, then apply baking soda moistened with several drops of olive oil to marred areas. Wait five minutes, then buff in gently, using a soft sponge. Clean thoroughly with a damp cloth and dry with a towel. Good for scratch repair on both wood and laminate floors, Scratch Away ($6.99 for eight ounces, available from Lumber Liquidators) cleans, polishes, and reduces the appearance of scratch marks caused by dirt, shoes, pets, and furniture scrapes. Another well-reviewed product is Old English Scratch Cover ($4.82 for eight ounces, available on Amazon), available in both light and dark wood tones. This nourishing oil both protects and hides unsightly scuff marks. All you need is a soft cloth to apply on clean wood surfaces. Minimize the appearance of deep scratches with wood stain, which comes in oil-based, water-based, gel, and combination varieties. Oil-based stains dry slowly and can be difficult to work with but provide the richest, longest lasting color. Water-based stains are available in many shades, and make for easy application and clean up. Combination stains are designed for polyurethane finishes, while gels don’t penetrate and so can be used on a variety of materials, including previously painted wood. Choose the right stain formula for your wood’s finish, and fill in the scratch completely with the liquid color. Use a Q-tip to remove any excess stain and let dry. You can also find stain markers and blending pencils, though you may have to play with color combinations to find the perfect match for your floor. Apply to the scratch according to package directions, wipe away any excess, and allow to dry thoroughly. 7. Shine and revive with a different sort of commercial care product. Minwax Hardwood Floor Reviver ($24.97 for 32 ounces, available on Amazon) can help restore beauty and luster to hardwood floors without sanding or buffing. Clean the surface of dust and debris, then apply a single coat with a clean paint pad (like this product recommended by Home Depot shoppers) and let dry. Available in both high- and low-gloss—choose the sheen that’s right for you—and formulated to last three to six months. 8. Strip it off and start anew. If wood floors are in pretty sad shape, covered by layers of polyurethane, wax, or even paint, you can strip them to reveal their unfinished beauty. Choose a liquid stripping agent, such as low-fume 3M’s Safest Stripper ($14.02 for 32 ounces, available on Amazon). Follow product instructions carefully to apply, then use fine-grade steel wool, rubbing in the direction of the grain, to remove any excess stripper. If you intend to strip only a small section of your flooring, make sure you’ve also patch tested a matching stain and polyurethane coating to apply after the stripping process is complete. For deeper gouges in your wood, try a product like Bondo ($18.15 for one ounce on Amazon)—a wood filler that can be sanded and stained, or painted. You can also use a pre-colored latex wood filler like DAP Plastic Wood ($9.48 for 32 ounces from DAP). Fillers come in a variety of colors and may need to be blended to match your floor exactly. This option is best for small, deep holes that can then be filled, sanded, stained, and finished, leaving your floor flawless once more.